A consortium of water/wastewater agencies and shareholders with a shared commitment to ensuring operational reliability through workforce reliability. Baywork is actively engaged in helping agencies provide their employees with the skills and knowledge they need to do reliable work. This Toolkit describes programs and provides links to tools in five basic categories. These processes are highly interrelated. For example, development of a successful technical training program often requires development of Standard Operating Procedures (a form of documentation) as a first step. However, differentiation of these concepts has proven useful to many utilities in designing their knowledge transfer programs. The descriptions below explain how these terms are being used in the Guidebook. The process of identifying areas of operational risk associated with workforce challenges, and developing programs for mitigating that risk. The term Succession Planning is sometimes applied to this area of activity, but the term Workforce Reliability Planning includes knowledge transfer challenges that would exist even if current workers were expected to stay at the same jobs indefinitely. Sample activities include identification of high-consequence, high-risk tasks, and assessment of whether adequate tools have been put in place to insure that both new and current staff are prepared to perform them. Involves steps an organization can make to eliminate or reduce the need for some knowledge and skills to be transferred. For example, a task might be automated rather than performed manually (e.g., meter reading). Analysis of work processes can also identify unproductive steps. An example of a work modification program would be having a regular audit (every 3-5 years) of key operational processes to identify if any modifications are needed. Material that provides official information on the organization, its facilities, systems, and equipment; and its processes and procedures. Examples can include standard operating procedures, as-builts, checklists, manuals, reference guides, and policy statements. All activities that are aimed at bettering the performance of individuals and groups in an organization. Examples can include cross-training, technical training, staff development, mentoring, job shadowing, roundtables or communities of practice, creation of a learning community, e-learning, and professional association involvement. The process of capturing, developing, sharing, and effectively using organizational knowledge. It refers to a multi-disciplinary approach to achieving organizational objectives by making the best use of knowledge. Examples can include on-line knowledge management systems such as SharePoint (web content management system) or Wiki (a content management system), libraries, databases, and learning management systems (ability to view, listen, and interact with data). Click on left image to view. For those familiar with workforce issues in the water/wastewater industry, it is blindingly obvious that knowledge transfer to and among employees is a matter of immediate and paramount concern. An accurate understanding of the urgency of the problem can lead to the inaccurate perception that there is no time for workforce reliability planning. 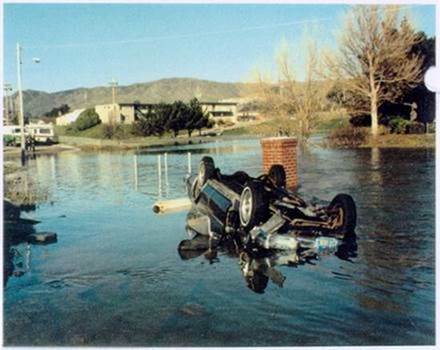 The water/wastewater industry prides itself on a Can-Do attitude that favors actions over planning– a bias useful in emergency response, but ultimately inefficient when the task is to build focused knowledge transfer programs. It isn’t realistic or necessary to build knowledge transfer programs that address the detailed information needs associated with every task of every employee in the organization. The work performed by employees in some key job categories (e.g., water and wastewater treatment operators) has more direct impact on the utility’s basic responsibilities to customers and the environment. Among the responsibilities assigned to these employees, errors in performance in some tasks have potentially more serious consequences than missteps in others. Since agency resources are limited, it makes sense to focus on mission-critical jobs and tasks. It is also important to consider the utility’s needs for future as well as present operations. A rush to document all current practices may perpetuate processes that should be updated through new procedures, equipment, or work practices. Although immediate actions in areas that immediately come to mind may get an agency off to a quick start, it is ultimately more cost-effective in terms of both dollars and staff time to conduct workforce reliability planning, beginning with a systematic review of planning processes that have been used by others to perform this important task. Even if their findings and priorities are quite different from a utility’s preliminary assessment of its own situation, it will be useful to see what questions other utilities asked, how they asked the questions, who they asked, their processes for documenting findings, and how they formulated a program based on those findings. 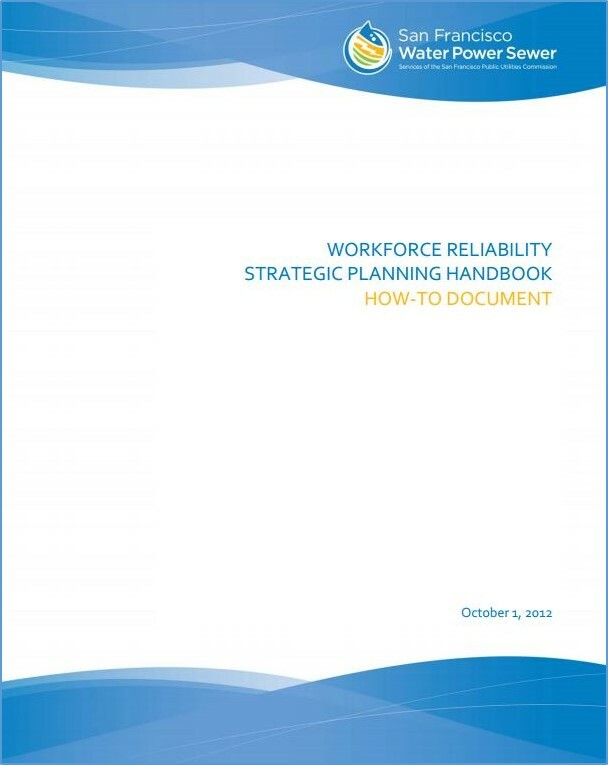 An example of one utility’s approach to workforce reliability planning is the Five-Year Strategic Plan on Workforce Reliability in Operations published by the San Francisco Public Utilities Commission in 2012. Steve Ritchie, Assistant General Manager for the SFPUC Water Enterprise and Catherine Curtis, Workforce Reliability Manager for the SFPUC Wastewater Enterprise, speak with Robert Scott about the 5 Year Strategic Plan. 1. Which job categories are mission-critical? 2. Where are weak organizational processes (e.g., recruitment, documentation, staff development, technical training, and knowledge management) putting the preparedness of staff at risk? The SFPUC then invited in speakers from utilities with strong programs where the SFPUC had identified weaknesses in its own processes. Click on images to view presentations and videos. These presentations included an opportunity for staff to brainstorm about how the SFPUC could learn from other programs. 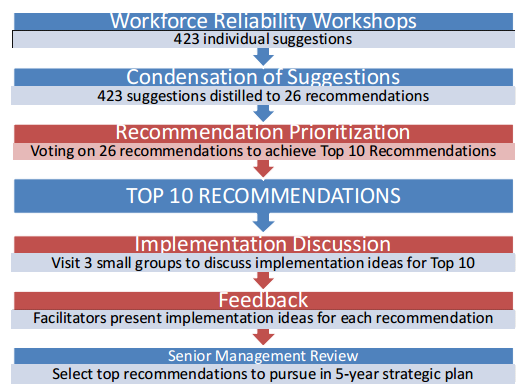 This discussion generated 423 suggestions which were consolidated into 26 recommendations, and evaluated at a workshop where staff were asked to identify their Top Ten workforce reliability concerns. Of the four priorities selected by SFPUC for further focus, two related to knowledge transfer: Staff Preparedness and Optimizing Staff Utilization. The recommendations contained in the proposed 5-Year Strategic Plan for Workforce Reliability in Operations were adopted by senior management in 2012. Since the processes that were used in creating the plan were also potentially applicable to other utilities, BAYWORK published a Workforce Reliability Strategic Planning Handbook. This handbook focuses on the processes and forms that were used to support the planning processes and could be used at the utility, regional, or even national level. Click image to access handbook. Another example of proactive workforce reliability planning is Succession Planning, defined by the City of Plattsburgh, New York, as the process of developing a systematic approach to building replacement workers to ensure continuity, by identifying potential successors in critical work processes. They define Succession Management as an integrated approach to workforce recruitment, development, and retention, to ensure that the organization has candidates prepared for individual success who can also contribute to the success of the organization. John Ruff with the City of Plattsburgh has developed a rating exercise that allows utilities to rate their own status in relation to Succession Planning. Click on image to view presentation. - Define how vital information will be retained within the organization despite attrition. Robert Scott with Baywork speaks to Jon Ruff with the City of Plattsburgh, NY, about succession planning. Click image to view video. Another template for Succession Planning is being used by West Bay Sanitary District in Menlo Park, California. The approach was developed by Donna Wies Consulting as part of the Bay Area Collection Systems of the Future Project. - Availability of qualified internal and external candidates. This process includes identifying not only skills and knowledge currently needed, but also new skills that may be needed to meet future service needs and changing customer expectations. Findings are summarized in order to identify high priority positions or tasks. Specific strategies are then matched to specific risks that had been found in the Needs Assessment. For example, where a single individual is found to be knowledgeable about a mission-critical process, appropriate strategies would include documenting these work processes and cross-training other employees through work rotations or temporary assignments. 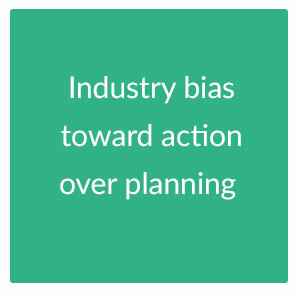 A template was developed for developing individual Action Plans, reflecting this mix of risks and strategies. Starting with positons with the most risk, employees then work with their supervisor to list critical tasks that they perform and begin to build a succession plan for their position. - Document work procedures through Standard Operating Procedures, process maps, desk manuals, etc. To view more information on Workforce Reliability Planning, click the button below. An important component of a knowledge transfer program is screening. Some current practices need to be documented so that knowledge can be transferred; others need to be modified or eliminated. When staff retirements and turnover are anticipated, there may be an opportunity to redesign processes so that objectives can be met more efficiently and reliably. When major changes in technology are made (e.g., construction of new treatment facilities), the way the work is done has to change, and it is critical to provide staff with knowledge on how to operate and maintain new facilities. Some general principles for screening and redesign of processes from a knowledge transfer perspective are provided in this chapter, with examples of how other agencies have used change as a springboard for improvement. In 2010, BAYWORK investigated work innovations that BAYWORK signatories had adopted in order to be able to do more with less. Information was gathered on areas where signatories had increased their efficiency through increased use of information technology; modification of work processes and classifications; and inter-agency agreements. 15 agencies reported 25 innovations; 14 of these involved use of information technology. Click on images to view. 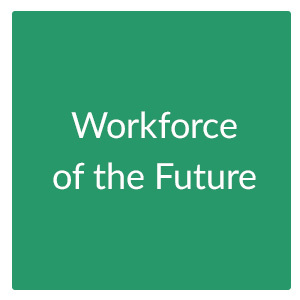 Baywork White Paper on Workplace Innovations. Use of handheld devices to enter and modify information on assets as part of an asset management program. Implementation of information technology initiatives is rarely quick or easy, but focused attention can produce long-term benefits. 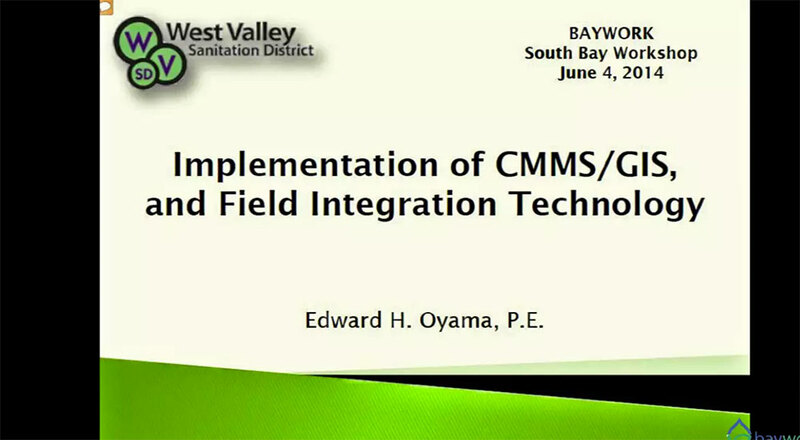 In 2010, at the time of the BAYWORK workshop on work innovations, Santa Clara Valley Water District was initiating use of handheld devices to gather asset management information on its water treatment facilities. By 2015, the agency had expanded the sophistication and scope of its program, collecting information on watershed assets as well. Use of hand-helds to perform and record condition assessment information was fully integrated into the agency’s asset management program. When there is a necessity to build major new facilities (e.g., a water or wastewater treatment plant), there are often decisions to be made about how highly automated the new facility will be. An example is Metro Vancouver’s Capilano Filtration Plant, a 475 MGS plant with UV disinfection required for two sources. Metro Vancouver staff made a conscious decision to build using a highly-automated design philosophy. This included use of advanced technologies to meet operational performance criteria; automation strategies linking optimization tools directly to the control system; and use of neural network modeling tools, expert systems tools, and new decision support technologies. Screening— It should never been assumed that a job should be done in the future the same way it has been done in the past. The possibility of doing the job more efficiently through use of information technology should always be taken into account. Agility-- The mechanics of how jobs are performed will change on an ongoing basis, pressuring organizations to become more adept at transferring new information to their employees. In many utilities, job classifications take on a life of their own, keeping the same titles, job descriptions, and job requirements long after the organization’s needs have substantially changed. Organizational processes for redefining job categories are often cumbersome, discouraging appropriate updates. Nonetheless, sometimes modification of existing job classifications is an integral component of the knowledge transfer process. And revise job descriptions and position requirements. This set of job classifications was replaced by a new set of job descriptions with standardized job descriptions and a more flat organizational structure. Implementation of such extensive modifications was a multi-step process that included development of transition plans for existing staff lacking the credentials and skills that would be needed for the new job classifications; consultation with the employee’s union; developing a cross-training program; helping staff acquired needed certifications; and creation of an Operations Supervisor-in-Training position. In implementing this change, they were able to create an operator-friendly shift schedule, flexibility, variety, and new job opportunities. 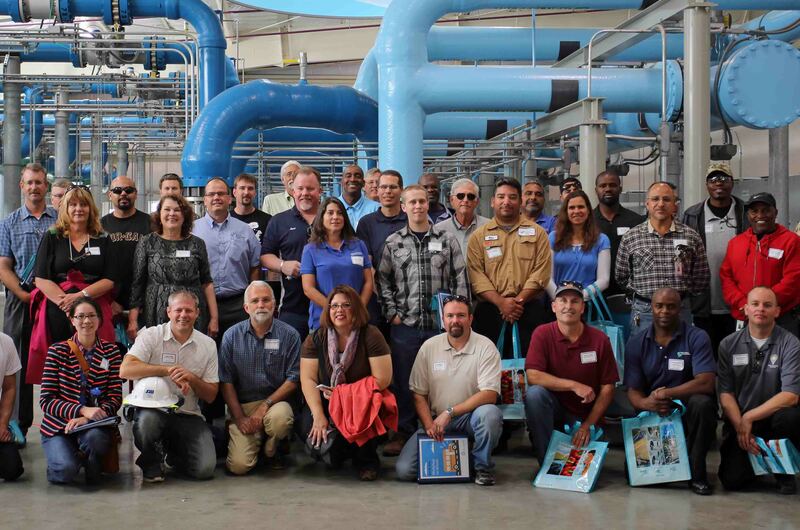 A thoughtful, methodical program was also the key to the success of the City of Daly City, California in combining their water treatment and wastewater treatment job categories into a single classification. This change was made in order to optimize operating flexibility for facilities that needed to be staffed on a 24/7 basis. An additional goal was to improve employee retention by creating a higher-paid job category that was consistent with the higher skill level required. Participation in the program was voluntary, providing employees with the option to opt-out. The City supported the employees in getting the additional certifications required in order for them to have dual water/wastewater certifications by paying for books, reimbursing employees for training if they passed certification tests, and allowing them to flex-up into the higher-paid job category as soon as they had the certifications required. Patrick Sweetland from Daly City telling Robert Scott from Baywork about his combined operator training program. 3. Decrease organizational vulnerability to knowledge loss by increasing the number of staff members who know how to do mission-critical jobs. Often utilities do not fully realize how dependent they are on the undocumented knowledge of a single individual until that person becomes unavailable due to health issues, acceptance of a different job, or retirement. An organization may have multiple individuals in a particular job category, but few with detailed information on an important process. 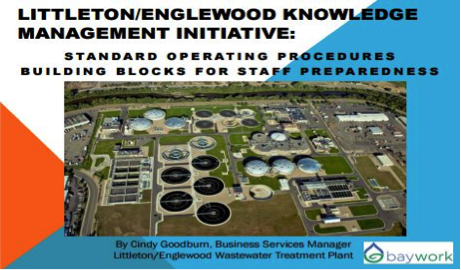 Littleton/Englewood’s Wastewater Treatment Facility’s extensive investment in documentation and creation of a knowledge management system was spurred by an operational crisis that occurred when there was one person who knew how to manage the scheduled shut-down of the plant, and that one person was in the hospital. Click on images to view. On the business side, Sacramento Municipal Utility District discovered that their revenue stream was at risk because of the pending retirement of a single employee who had handled all financial aspects of the company’s natural gas resources in New Mexico. This employee, who had been writing checks for 10’’s of 1000’s of dollars per year for gas royalties, had developed a complicated proprietary data base which only he understood. While he initially described the process as simple, the SMUD’s knowledge transfer team did ten interviews with this staff member and developed eight process maps in order to document the work that was needed to maintain access to this resource. Click on image to view. Gabe Lewall with Sacramento Municipal Utility District talking about Knowledge Capture. We do the job the way we’ve always done it. We constantly look for the best way to get the job accomplished. Paid to do, not to think. The organization was better prepared to handle staff turnover because knowledge was dispersed among the entire team. Another way to avoid over-dependence on a few employees is to standardize work processes and equipment across the organization so that more employees are doing the job the same way. 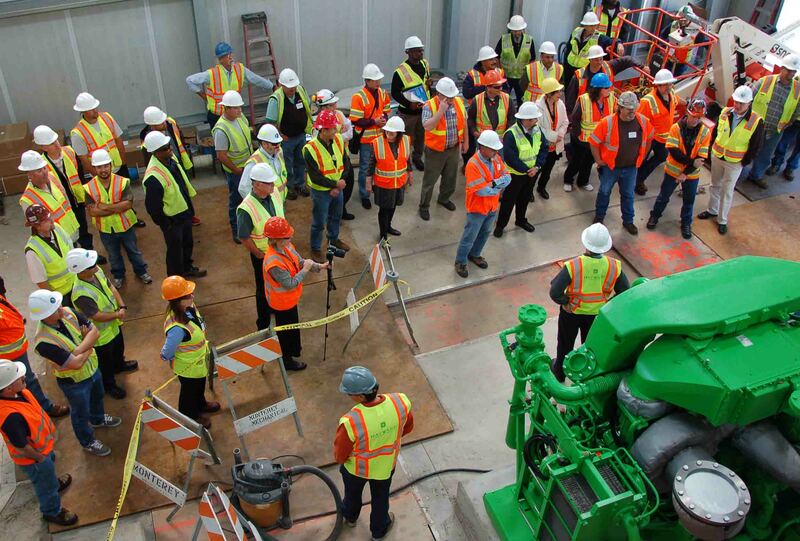 Contra Costa Water District in California decided to standardize the equipment it used in certain categories (such as valves) to minimize their need for staff training. Often equipment purchases are made on a least-cost basis, not taking into account the cost of the time required to train staff to use multiple types of equipment. When equipment is standardized, there are likely to be more staff members who know how to maintain and operate it. It is also possible to protect against over-dependence on specific individuals by having documentation such as Standard Operating Procedures, technical training materials, and other information resources readily available to a wide range of employees. “Constructing a New Paradigm: Building a Visual-Centric Knowledge Management System” Presentation. Click on image to view. The City of San Jose Regional Wastewater Facility’s use of GIS Software for Documentation and Knowledge-sharing. Click on image to view. Documentation is a key building block of an effective knowledge transfer program. It is not defined by a particular format; it might be a Standard Operating Procedure, photograph, video, map, an as-built drawing, a system diagrams, or a record in a geographical information system. Documentation helps staff know how things are, where things are, why they are a certain way, and what they need to do in order to operate and maintain the system. For example, when a wastewater treatment plant is constructed or significantly modified, it is important for staff to receive, in an easily accessible form, as-builts that show how the facility was actually constructed, as well as operations manuals and standard operating procedures on how to use new equipment, systems, and infrastructure. Historically, it was common practice for utilities to rely on the knowledge of experienced employees as “virtual documentation”; the basic documentation/staff training/ knowledge management program of many water and wastewater providers boiled down to “Ask Fred.” This risky approach occasionally had negative consequences. A water treatment plant employee might pour treatment chemicals into a drain in the floor that led to a creek, resulting in a fish kill and regulatory violation, because regulations had changed since the treatment plant was constructed, and the standard operating procedures for the process had not been updated. A plumbing supervisor might direct the wrong valves to be turned on a transmission system, causing flooding of City streets, as a result of inadequate documentation of the transmission system. Although mistakes were made and had serious consequences, the operational and financial risks associated with inadequate documentation were lower in decades when most employees were experienced, much of the equipment and infrastructure was familiar, technologies were not changing so quickly, regulations were more limited, and public expectations were not as high. For some employees with specialized expertise, documentation itself can serve as an effective training tool. However, a system diagram or plan specification that fully answers the questions of one staff member may not be intelligible to another. Development of training materials often requires repackaging content in ways that will communicate effectively with the intended audience, translating the facts reflected in the documentation into the implications for the work associated with different tasks. If adequate documentation is available, development of training materials can begin with gathering documentation related to the task (e.g., drawings, equipment lists, and design information). Standard Operating Procedures are a valuable form of documentation for water and wastewater facilities. Metro Vancouver’s process for creating Standard Operating Procedures begins with drawings and equipment lists and includes process graphics cross-referenced to assets. While documentation is not a substitute for development of staff training materials, it is a prerequisite. Many agencies which attempt to skip this step discover when they attempt to develop training materials that experienced staff disagree among themselves on how things are, sometimes even what and where they are, and how work related to them should be performed. Both subject matter expertise and technical writing skill are required for the creation of readable Standard Operating Procedures. 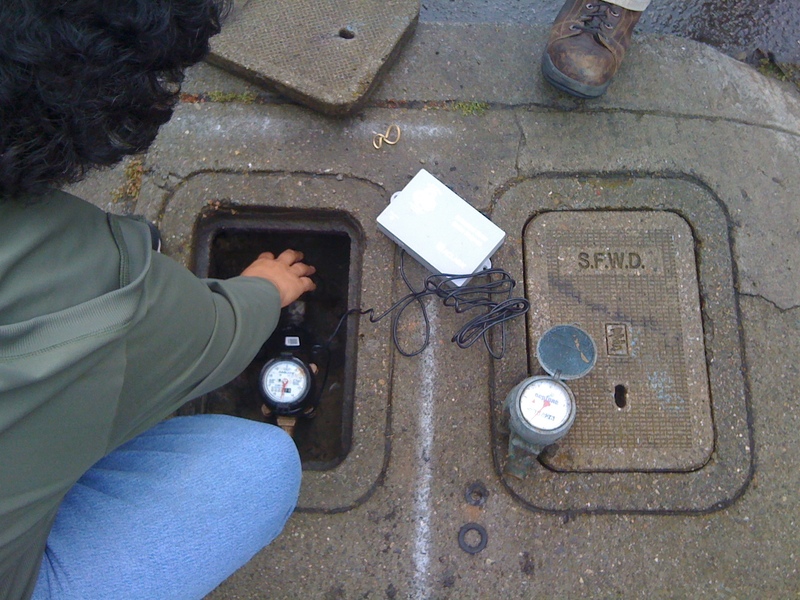 Because this task is both important and difficult to do well, the Wastewater Collections Section of San Francisco Public Utilities Commission has developed a Standard Operating Procedure on how to develop SOPs. Example of an SOP Development Flowchart. Click to view. SCVWD process owners use the District’s Document Control System to document key activities in their business areas, especially those that are complex. Creating a library of documentation that captures the knowledge of current employees helps the organization maintain operational reliability in the face of staff retirements and turnover, helps the agency respond to audits of their processes and procedures, and supports continual improvement by providing a mechanism for updating procedures when technologies and regulations change. The documentation developed by Santa Clara Valley Water District allows employees to lay out not only the steps involved with processes, but also employee roles and responsibilities in relation to the task, and resources needed in order to perform it. Because of the important role this documentation plays in operational reliability, the process also includes a form for review and approval of documents that are added to the system. Click on images to view. Santa Clara Valley Water District has also found it valuable to establish templates for documentation of their important procedures, processes, and forms. Their program emphasizes not only creation of documentation, but easy employee access to it. The intranet system used by Santa Clara Valley Water District provides a home page for each business area. This home page includes a link to the web-based system where the library of documents is stored. Within this library, employees can search for documents by parameters such as titles and keywords. Although SCVWD uses a proprietary software system for this library, use of a focus group of new employees during implementation of the system provided SCVWD with the employee input needed to make this software system as user-friendly for employees as possible. The model used by many agencies for preparation of documentation on processes is to pair the instructional design and technical writing skill of an in-house Learning Officer with the expertise of a staff member who is skilled and experienced in doing the work. Given that most agencies start from a position of severely under-documented systems, it is important not to under-estimate the magnitude of the task or the amount and diversity of the resources that will be required to address it. Click on image to view. Many organizations have found it beneficial to include photographs, flowcharts, and graphics in their Standard Operating Procedures. Video SOP’s can also be effective, particularly when they are based on written procedures and reflect careful planning (e.g., scripts and story-boards). Other specialized skills will be needed to create new documentation if a special format is required (e.g., as-builts, geographic information systems, 3D imaging, etc.). Click on images to view videos below, presentation upper right. Although subject matter experts must be involved in the development of documentation, the people who know the most are also often the people who time is least available. While the danger of losing their undocumented knowledge poses a serious risk long-term, their support is often vital to day-to-day operations, making it difficult to pull them away from ongoing responsibilities. An example of how this challenge can be addressed is to create new classifications whose sole responsibility is to create documentation, or to clearly modify the assignments of other positions to assign them a substantial role in this area. At Littleton-Englewood Wastewater Treatment Plant in Colorado, for example, increased automation of a portion of the daily work of wastewater treatment operators made it feasible to create a position for the work of documentation, while also modifying the job assignments of other supervisors and operators to contribute to this work. In addition, part-time assignments were made very clear, and accountability was addressed, by using their automated work order system to record both the creation of documentation tasks and progress toward achieving them. Click on images to view. Some utilities have found it beneficial to work together to create Standard Operating Procedures. In Colorado, an SOP Cooperative has been created so that utilities can share the work. Click images to view presentation on left and video on right. In the long run, for documentation to be adequately addressed, it has to be integrated into the basic workflow of the organization. For example, adequate as-builts must become a requirement for renovations and capital projects. Standard operating procedures must be provided to inform staff about new regulations, equipment, technologies, and facilities. It is the responsibility of the organization to let staff how to perform their work correctly. Procedures for how to build different forms of documentation are essential, so that documentation is viewed as part of the process rather than a special project. To learn more about how other water and wastewater utilities have built successful documentation programs, click here. 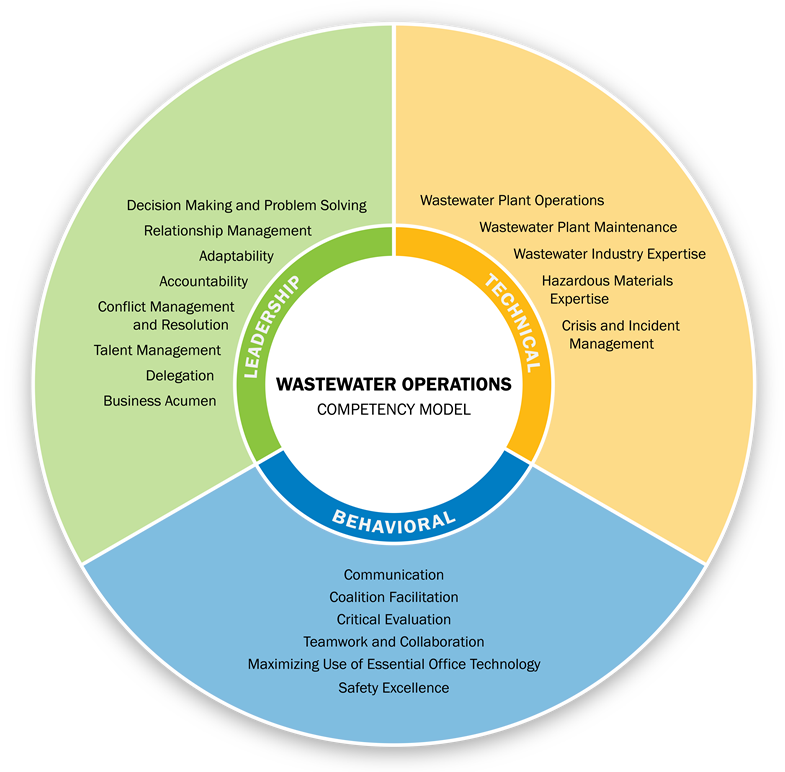 All water and wastewater utilities share the challenge of making sure that employees have the both the technical and soft skills (e.g., communication, supervision, or leadership) required to perform their jobs effectively. This challenge is increased in periods of high turnover and retirements, but is also an inevitable result of ongoing changes in customer expectations, technology, regulations, and infrastructure. The skills and knowledge that employees need to be eligible for a position when they are hired are not sufficient to keep them prepared for the tasks they will be asked to perform over time. When BAYWORK conducted site visits to utilities that were outstanding in preparing their staff to do quality work, there were significant differences in approach. What they had in common was the understanding that significant investments in time and money were needed to ensure that their employees were prepared to do their work reliably. D. Make an investment commensurate with the task. The necessity for continuous learning means that water and wastewater agencies must upgrade their ability to be teachers as well as employers. Applying an asset management approach means, first of all, recognizing that knowledge is an asset. However, organizations do not own the knowledge of individual employees, they only have temporary access to that knowledge while the individual in employed and willing to apply that knowledge. When employees retire or move to a job in a different organization, access to the knowledge is lost unless it has been documented and stored in a location and format that is understandable and accessible to others. In order to be resilient in the face of both staffing change and changes in the nature of the work itself, agencies need to convert employee knowledge into assets the organization actually owns, such as documentation, training materials, and resource materials (such as checklists, operations manuals, maps, and as-builts) stored on knowledge management information systems. Before you can determine the training and staff development needs of employees, it is important to define what they are expected to accomplish to support the organization’s overall mission. Depending on the organzational level of the employees, this could be done at a task level or a broader perspective. For example, Metro Vancouver developed a list of technical roles and tasks for their Water Treatment Operators. Metro Vancouver's list of technical roles and tasks for their Water Treatment Operators. It is essential for utilities to define what employees in key positions need to know and be able to do in order to meet their performance goals. Often jobs are analyzed at the task level. The San Francisco Public Utilities Commission, for example, has analyzed the tasks and developed competency standards associated with operation of its wastewater treatment facilities. 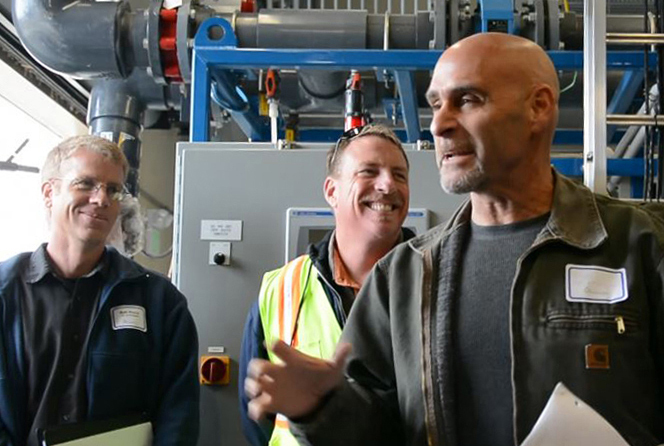 At the San Jose-Santa Clara Regional Wastewater Facility, a Job Competency Requirement (JCR) reflects the minimum knowledge and skills an employee must demonstrate in relation to competency requirements at the fundamental, systems, and task levels. Training staff have worked with subject matter experts to define competency requirements and Standard Answers for questions designed to measure these competencies. Click images to view. These models will also provide a guide for individual career planning and development. Staff will be able to see the commonalities among jobs and identify possible career paths, both promotional and lateral. Supervisors and mentors will have tools to guide and coach their staff and protégés, and hiring managers will be able to utilize both the models and the aggregated workforce data for performance management, selection, and workforce planning. 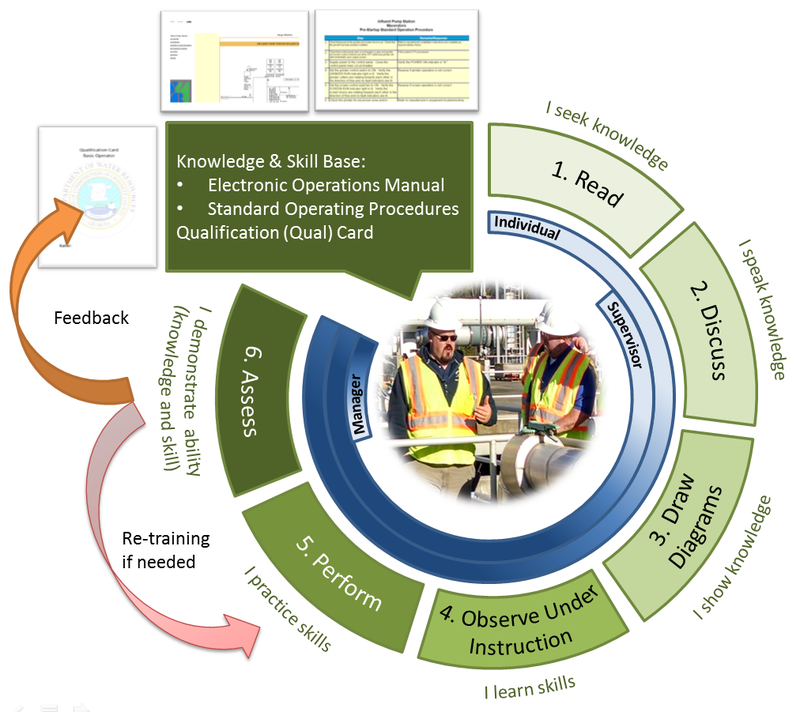 Gwinnett County developed a three-pronged system for defining, documenting and training for the skills and knowledge needed for operators at their new Yellow River Basin facility. An electronic operation manual (EOM) is a well-organized, searchable, and easily accessible library of operations and maintenance data. It contains information such as supplier operations & maintenance (O&M) manuals, as-built drawings, schematics, renderings, procedures, and protocols to aid in the operation of the plant. Standard Operating Procedures (SOPs) provide step-by-step operating procedures for plant specific processes and equipment. They detail the operation of equipment, routine preventative maintenance, basic troubleshooting, and safety precautions for every major system. The Qualification (Qual) Card is a written set of training requirements sequenced from influent to effluent in the plant. Each major section is a process in the plant (i.e., Preliminary Treatment) and each subsection is a system in that process (i.e., Grit Removal). BAYWORK members have conducted research, including site visits, to gain information on the staff preparedness programs of utilities that have done outstanding work in the field. The results of this research and the presentations and resources associated with these site visits are available on workshop pages available from the Resources Section of the BAYWORK website. Click on images to view . The SPFUC is using a competency-based framework across the organization for organizing critical knowledge and skills. A competency is a collection of closely related skills, knowledge, abilities, and traits that are needed for high quality work. Competencies are a useful way to group many individual skills, abilities, and traits into umbrella concepts, thus enabling staff to discuss performance with a manageable, unified set of terms. It also helps make connections between different jobs – even jobs in different occupational series or fields. The most useful competency models also provide behavioral examples to illustrate what success in that competency looks like at each job level. Together, these competencies and their behavioral examples provide a framework for staff at all levels to understand what is expected of them and what they can work toward as they progress in their career path. Going beyond the task level, a broader approach to analyzing staff training needs has been used by Union Sanitary District. This approach takes into account the necessity for employees to understand their jobs at multiple levels: Fundamentals (e.g., trenching and soil compaction in the case of a backhoe operator), system components, and component parts (e.g., back-up alarms), and tasks (e.g., inspection of the job site). Training at the systems level is particularly important when actions at a specific site can have impacts throughout a water or wastewater system (e.g., a plumber making a valve change on a transmission pipeline or a water treatment operator changing the flow rate at a water treatment plant that feeds directly into a regional water transmission system). In order to perform their work responsibly, employees may need to understand a water system as a whole, as well as specific components and operations. Organizations also need to identify the soft skills needed by staff in order to do their work well. Employees moving into supervisory and leadership positions may not be prepared for the non-technical aspects of their new roles. Current supervisors and managers may also need new skills in order to upgrade the way they handle their current responsibilities. In its Leadership Development and Succession Planning efforts, USD began with identification of the skills needed by staff in order to become effective leaders at all levels of the organization. This assessment determined both the courses developed in-house for employee training (e.g., Team Development, Communications, and Recruitment and Retention), and the courses employees could take (and be reimbursed for) at a local community college. Yarra Valley Water in Melbourne, Australia, has used a proprietary assessment tool to evaluate its corporate culture, helping them identify the soft skills training needs of their staff. Application of an asset management approach normally includes a risk assessment that takes into account the likelihood that a problem will occur (e.g., the probability of an earthquake of a certain magnitude) and the potential consequence of failure. Similarly, an asset management approach to staff knowledge takes into account how likely a mistake is to occur and how serious the consequences of staff error could be (e.g., in terms of employee health and safety, violations of water quality or environmental regulations, or destruction of property). Metro Vancouver analyzes tasks based on the likelihood (complexity of the tasks and probability that an error will result in an incident) and the potential severity of impacts. Click image to view. 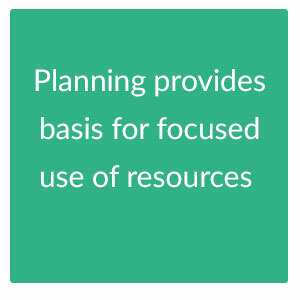 A different approach to prioritizing training needs is taken by Colorado Springs Utilities, which has a central training unit which responds to the training requests from supervisors by analyzing the real problem to be solved, as well as the most appropriate type of training tool needed if the actual problem is verified to be lack of training. Click images to view. In 2008, the Water Supply and Treatment Division of the San Francisco Public Utilities Commission did a self-assessment in which supervisors identified the tasks associated with operating the Division’s major water treatment facilities. Employees were then asked to participate in a confidential online process in which they rated themselves in terms of how confident they were of their ability to handle each task. The outcome was that many long-term employees were not confident in their ability to perform all key processes at the facility where they worked. Employees in the same job classification at a single facility were handling different tasks and were not necessarily prepared to take on a different set of tasks if a co-worker left. Click on image to view. San Francisco Public Utilities Commission's West Coast Water Utilities Workshop on Workforce Development presentation on self-assessment results. In order to track employees’ access to documentation and training materials, SFPUC commissioned an assessment of the availability of knowledge management tools for facilities added or upgraded through a multi-year, multi-billion capital improvement program. The accounting process of many organizations makes it difficult to track expenditures related to staff knowledge. Professional services, payments to vendors, and the salaries of full-time training professionals may be readily identifiable, but the contributions of subject matter experts to development of documentation and training materials are often untracked. Littleton-Englewood Wastewater Treatment Plant is an exception to this rule. Work orders are created when training materials need to be developed. One or more individuals are assigned to develop the training materials, and their time is recorded against the work order. The work order is closed when the training material is complete and added to Littleton/Englewood Wastewater Treatment Plant's on-line knowledge management system. Metro Vancouver addresses the issue differently, by relying on easily-tracked professional services contracts, where expenditures can be more easily tracked. Click on image to view. It is important to not only deliver training, but also to assess the extent to which an employee has learned the desired skill or expertise. Union Sanitary District routinely followed technical training with field evaluations which allow trainee to demonstrate new skills. 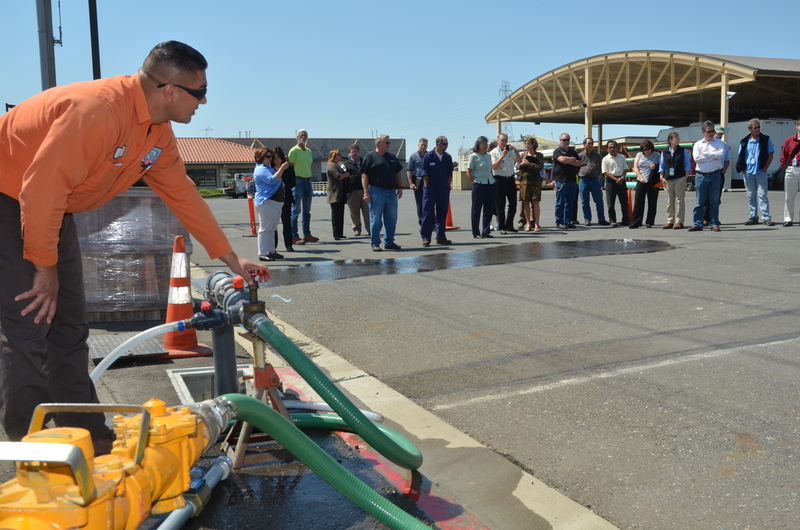 USD has constructed a training center where employees can test their skills (e.g., the ability to estimate the volume of a leak) without any operational risk to their wastewater system. Gwinnett County's Qual Card system is structured as a reinforcement cycle to ensure the learning is retained. Each operator must first read the applicable EOM and SOPs and sign when complete. Then they perform discussions, draw flow paths, observe, and performance procedures with their Supervisor present to demonstrate their ability. Finally, they prove their ability to the manager during a quality check. This quality check is not only on the student operator but also the training ability of the supervisor. A finished Qual Card provides documented competency to operate the plant. Metro Vancouver uses different approaches to the evaluation of learning acquired from different tools. Interactive e-learning modules were developed to teach water treatment operators about the basic operations of a new water treatment plant. Operators must provide correct answers to a set percentage of the questions in order to pass each module. Operators must pass all modules in order to be cleared for operating responsibilities at the plant. The learning package of water treatment operators also includes a hard-copy Field Guide that identifies information all trainees must learn. A companion document, an Assessment Guide, is used by the trainee supervisor to test the employee’s knowledge in each area. Employees learn in different ways and it is important to develop a suite of training tools that reflect this variation. In some cases, an employee can benefit from a training course that is specific to the skill, but not a specific agency or its facilities. In other cases, employees need to learn information that is specific to their organization’s infrastructure, facilities, equipment, technologies, culture, and/or procedures. Below is a summary of some of the training tools used by high-performing utilities. Click image to view. There are a wide range of training tools available to utilities. A key component of most successful training programs is combining the knowledge of subject matter experts with individuals who have the other skills required (e.g., instructional design expertise) to produce high-quality training materials. Subject matter experts work with instructional design experts to identify training needs and the type of training tools that will be most effective with staff. The subject matter expert helps gather the reference materials on which training should be based. Some subject matter experts also have the capability to provide training to other subject matter experts, using the finished product (a possibility made more feasible if the agency has a Train-the-Trainer program). Some agencies attempt to find subject matter experts who have the full range of skills described above. While organizations occasionally find gifted subject matter experts who can handle functions ranging from videography to technical writing, this is rarely a sustainable option. There are a number of other options for ensuring that an agency is bringing the right skills to the task. Combination of in-house and consultant support: The City of San Diego Public Utilities Department and the Colorado Springs Utilities, which have in-house instructional design experts, supplement their in-house training resources by helping utility staff locate and access external training sources (e.g., courses and training videos) when this is more cost-effective than developing and providing a training program in-house. In some cases, the training needed is not agency-specific, and the most cost-effective option is to purchase training services from a private vendor or educational institution. Some utilities have established relationships with educational institutions such as local colleges and universities who are able to provide support in these areas (e.g., videography support from student interns). 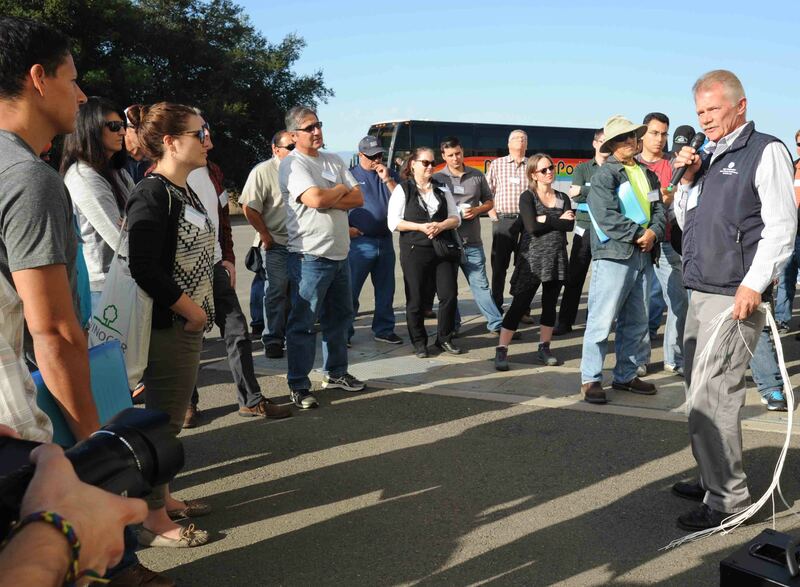 For example, Union Sanitary District partnered with Ohlone College to deliver Business Supervision classes as part of their Leadership School Program. Creation of additional positions, creation of working relationships with a new set of professional service providers, collaboration with educational institutions, and development of new strategies for inter-agency co-funding and management of such support services (e.g., creation of a regional training resource or collaboration with educational institutions) are all possible options for addressing this challenge. Images from Union Sanitary District's presentation on their Leadership School Program. Click to view larger images. 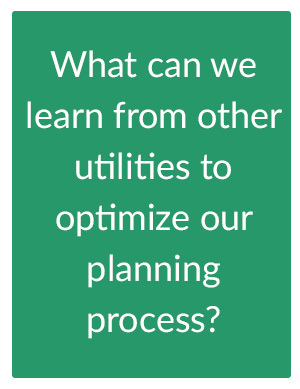 When utilities do infrastructure planning, they focus on performance measures (e.g., water quality and reliable water delivery) and risks that could jeopardize their performance (e.g., aging infrastructure). The concept of return on investment is emphasized less than risk avoidance. To reduce risk, utilities routinely construct redundant infrastructure-- pipelines, treatment facilities, and tunnels that may rarely be used--to avoid operational failure. The return on investment may ultimately be very low, but customers expect their water and wastewater systems to be reliable. Seeing the benefit of the training program produced by this investment, Metro Vancouver decided to protect its $2.4 billion dollars in water infrastructure and $3.1 billion dollars in wastewater assets by building a comparable program for operations and maintenance. Project 2, an Operations and Maintenance Department Technical Training Program, targeted 660 employees, involving a multi-year professional services contract of $11.9 million dollars and an in-house program manager with over five subject matter expert FTE’s. Colorado Springs Utilities, which provides electrical, natural gas, water, and wastewater services, with over 1800 employees, invested in a strong in-house training program with 24 employees, a budget of over $420,000 per year, and the ability to provide instructional design services, development of customized videos, and webinars. Today’s water and wastewater utilities have access to numerous knowledge-sharing techniques and tools. Some are technology-based, such as computerized management information systems; others rely primarily on human interaction, such as mentoring and job-shadowing. It is ideal when these tools are used to implement an overall organizational strategy for information-sharing—a broad, systematic approach that supports information-sharing among current employees as well as information-sharing with the employees of the future. Click on images to view. 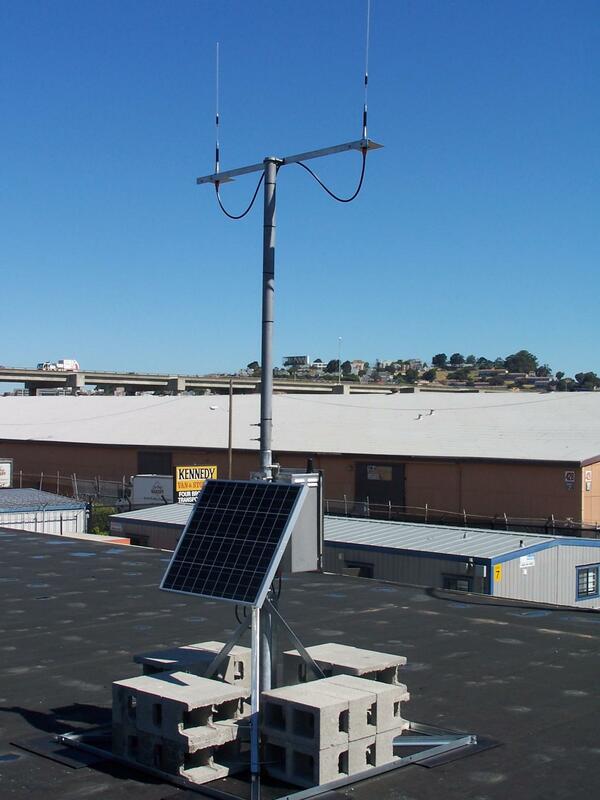 A knowledge transfer system that integrates use of a variety of tools has been developed by Sacramento Municipal Utility District in Sacramento, California. Their approach not only identifies useful tools, but also outlines the knowledge transfer responsibilities of managers, skilled incumbents, and learners (new hires or employees who have been transferred or promoted into new positions within the organization). Managers are assigned the responsibility to select and develop replacements for staff who retire, or are transferred or promoted into different positions in the organization. They are encouraged to hire new staff members, or arrange for an internal transfer or promotion, before a skilled incumbent leaves, to support knowledge transfer prior to the incumbent’s departure. Managers are also encouraged to reduce the need for knowledge transfer by employing strategies such as replacing current equipment with equipment that is easier to operate and maintain, replacing non-standard equipment with standardized equipment, and eliminating unnecessary tasks from job descriptions. 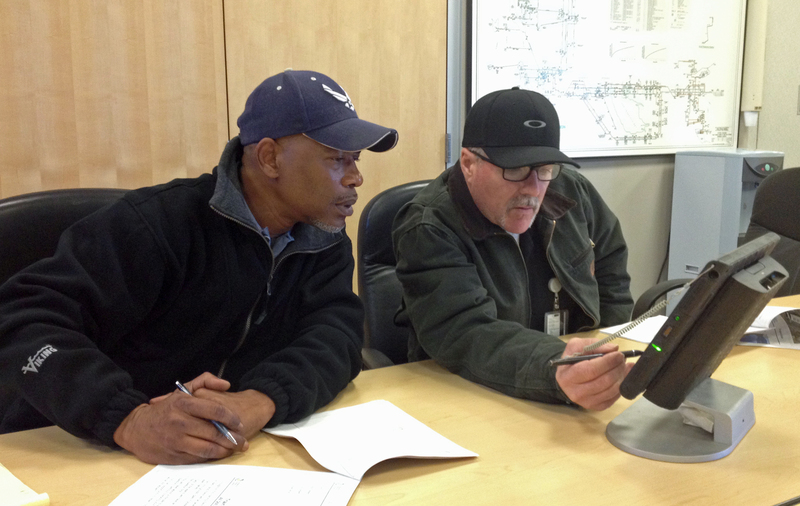 Gabe Lewell with SMUD talks to Robert Scott, BAYWORK Staff - Preparedness Chair, about Process Mapping. Click to view video. Employees are also held responsible for learning new knowledge and skills. Their on-the job-training is expected to include work with a mentor or coach, job shadowing, targeted work assignments, and special project assignments. They are expected to participate in in-house classroom training, external classroom training, and on-line training. Their learning is then assessed through paper-and-pencil and on-line tests. Employees are also encouraged to expand their knowledge by participating in professional associations. Attendance at association events with an incumbent is suggested as way to expand professional networks. The level of information-sharing prescribed by this system requires a corporate culture that values achievement of overall organizational objectives over the personal power associated with unique knowledge. Organizations where the historical culture reflects more information-hoarding than information-sharing may need not only a checklist of tools, but background information on what corporate culture is and how it can be improved. Zone 7 PowerPoint on Corporate Culture that was given as part of the SFPUC strategic planning workshop series. John Rossi and Jill Duerig with Zone 7 video presentation on Corporate Culture -part of the SFPUC strategic planning workshop series. Navigation structures can be established by organizational workgroup (so that every workgroup can find the materials germane to their work), by facility (an important organizing principle for operations and maintenance work), and/or other themes. Using links to a shared database, the same materials can be accessed through numerous alternative routes. Click Image to Enlarge Metro Vancouver posts all of the training materials developed for its water treatment operators on-line. Among the many tools used by SMUD and other utilities for knowledge transfer, computerized management information systems (e.g., wiki and SharePoint systems) might be considered super-tools. If thoughtfully and competently used, these super-tools can provide easy, ongoing access to key information developed in connection with a number of other knowledge transfer processes. Posting these materials to a computerized information system where information is freely shared promotes knowledge transfer within workgroups, among workgroups, and among employees over time. They can be used not only to store other knowledge transfer products (e.g., Standard Operating Procedures, staff training materials, Lessons Learned databases, process charts, checklists, photographs, and manuals), but also structured in a way that makes it easy for staff to find the information they need. While ability to add or modify data may be limited to certain individuals, access to data should be as broad as possible. Involvement of employees in decisions on how software will be used, and open access to information encourages employee engagement and communication, as is discussed in this video with Veronica Astells with the Town of Windsor, CA. Click on image to view. Robert Scott, BAYWORK Staff Preparedness Subcommittee Chair, interviews Veronica Astells with the Town of Windsor about their data management system. Many types of software are available for this purpose. Littleton-Englewood Wastewater Treatment Plant uses its INFONET system to provide wastewater treatment staff with easy access to general information (e.g., a service area map), plant manuals; emergency response procedures; safety procedures; information on power management; training materials; permits; lab information; maintenance information; and other materials used by operations such as Standard Operating Procedures, forms, documents, and information on process control. INFONET also provides templates to be used for creating different information-sharing documents (e.g., SOP’s). 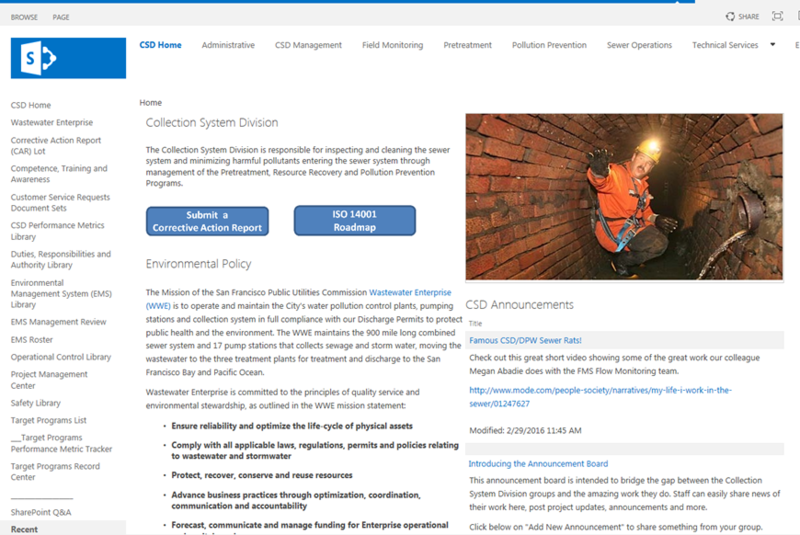 East Bay Municipal Utility District uses a Wiki platform to provide an easily accessible and collaborative forum for information sharing at all levels of the organization. The Wiki is a way of centralizing or “pointing to” documents, applications, websites, etc. stored in various locations. Some of the many uses for a Wiki include: active knowledge retention, on-boarding staff, transparent communications, personal development and preparation for promotional opportunities. 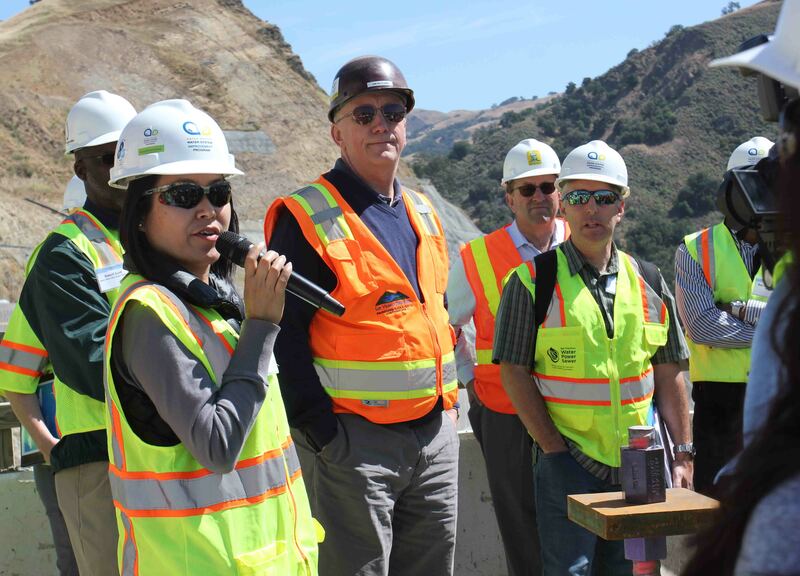 Click above to watch a video of Heidi Benenson from EBMUD describing their wiki. information used by wastewater collections operations staff. In the Wastewater Enterprise Collection System Division documents are organized by using the elements of the International Organization for Standardization 14001 Environmental Management System. 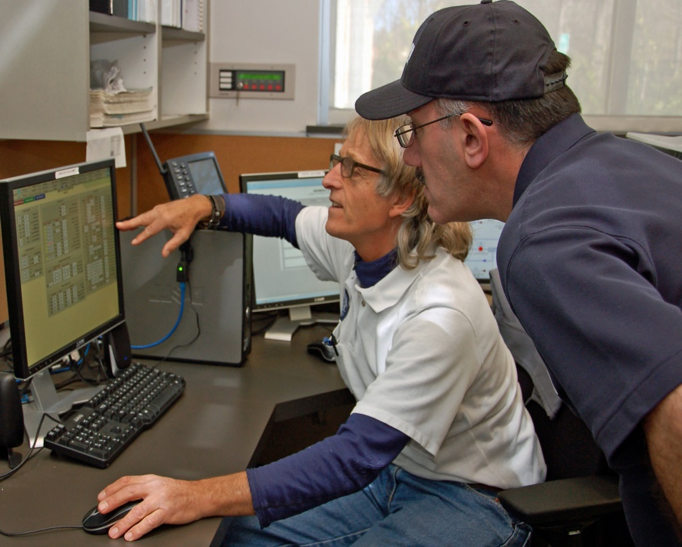 Santa Clara Valley Water District uses a computerized information system to post the procedures they have developed in connection with their ISO Certification program. The specific software selected is important, but probably less critical than the willingness of staff to take the time to think through which information will be stored and how, so that it is easily accessible among workgroups and over time. Robert Scott, BAYWORK Staff Preparedness Chair, talks to Karna DuQuite about their document control system. Knowledge transfer among staff of water/wastewater utilities has been a primary objective of BAYWORK since its inception in 2009. The Operational Reliability Roadmap adopted by its founders reflects four strategies, one of which is providing staff with the information they need to do quality work. Click on image to view. Ingrid Bella, Chair of Baywork, talks about Baywork with Robert Scott, Baywork Staff Preparedness Subcommittee Chair. BAYWORK has also published a number of How-To Guides that relate to knowledge transfer. Some have been written by BAYWORK; some have been written by BAYWORK signatories; and others have been provided by fellow agencies who are BAYWORK learning partners. These How-To Guides are all available from the BAYWORK website. BAYWORK’s approach combines all of the above, in hopes that good ideas that may not reach a utility through one approach will become accessible to them through another. 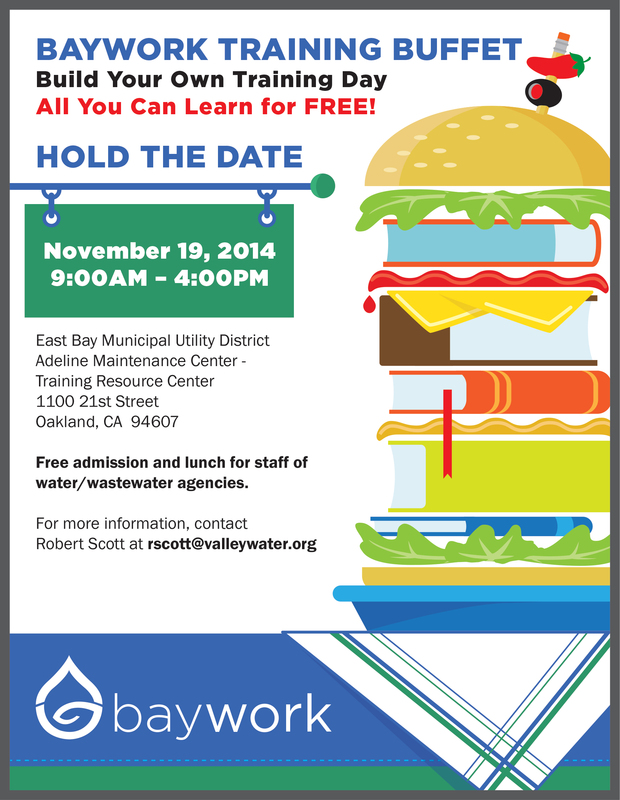 The business model of BAYWORK is such that attendance at all workshops is free to utility employees. In addition, all materials on the website (including How-To Guides and workshop materials) are downloadable. Costs are handled by BAYWORK signatories, through a combination of fees and in-kind contributions. Click on images to view. Another BAYWORK innovation in collaborative staff training has been the BAYWORK Training Buffet. All instructors are staff members of BAYWORK signatory agencies. 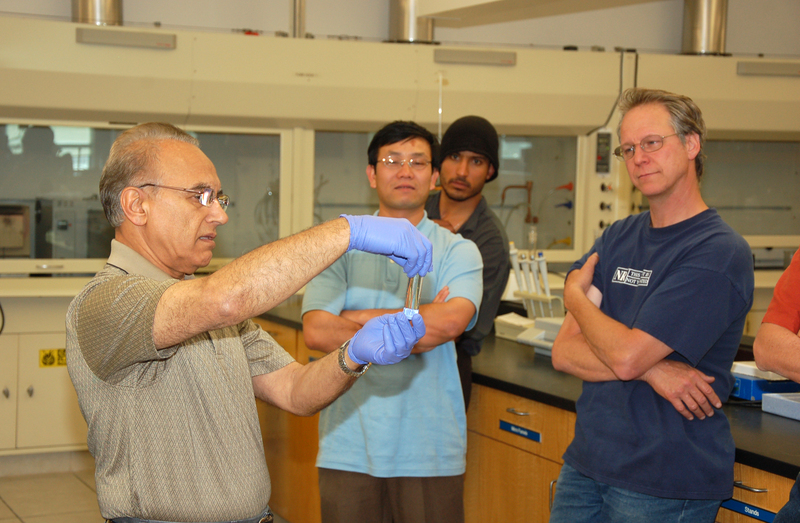 A wide menu of course options is provided, with course offerings ranging from technical training (e.g., water quality regulations) to soft skills (e.g., supervision). In addition, BAYWORK has held special purpose workshops in which signatories could discuss areas where they wanted to learn more by learning from each other (e.g., the held in 2015). Workshop attendees are allowed to customize their own learning experience by attending from one to four classes per day. Because all instructors are also utility employees, training sessions are directly relevant to the experience of attendees. Click images to view. One of BAYWORK’s basic strategies is to maximize the cost-effectiveness of workforce reliability investments through collaboration among utilities and stakeholders. This strategy has been very effectively applied in the area of knowledge transfer. BAYWORK’s experience has been that utilities can save professional services costs while providing training that is high-quality and directly relevant to utility work by making the knowledge of the most highly-skilled employees of various utilities available to all. Such information-sharing, in addition to immediate knowledge transfer benefits, encourages the development of long-term working relationships among staff of different water and wastewater utilities, so that knowledge transfer can continue. •On-site tours where the individuals who created and implemented the programs transfer their knowledge to the workshop participants who have arrived by bus. (Multiple agencies in a geographical area are visited in a day.) Click on image to view. BAYWORK Workshop on Wheels that have been provided for water/wastewater employees are listed below, with links to the workshop pages on the BAYWORK website. 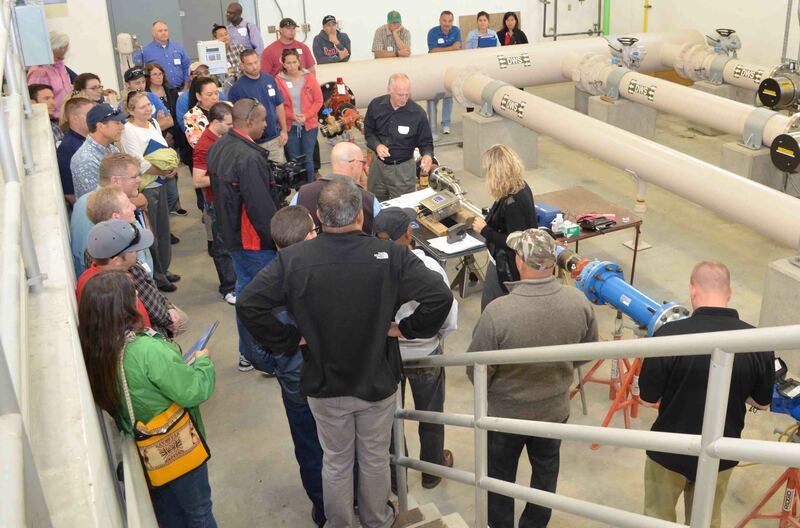 Each Workshop on Wheels reflects a different set of water/wastewater agencies and innovations. Click on images to view. BAYWORK has found webinars to be a cost-effective way of sharing knowledge among signatories and other learning partners. These webinars are also available from the Resources Section of the BAYWORK website. 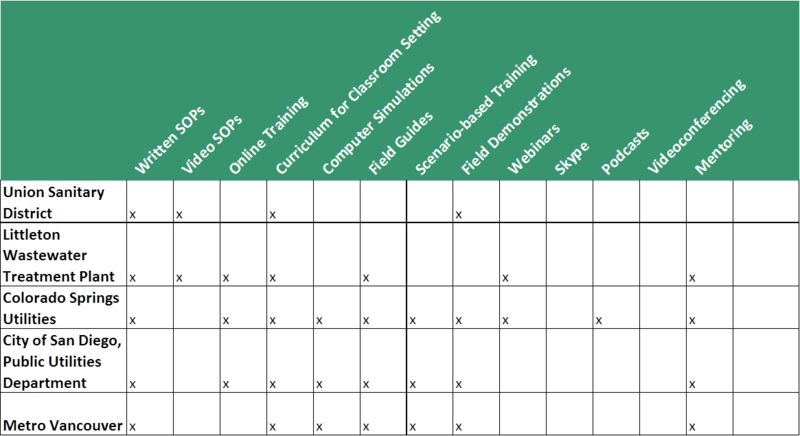 BAYWORK workshops that have included significant content on knowledge transfer are listed below. The Resources section of the BAYWORK website includes links to pages that provide information on BAYWORK workshops. These pages include PowerPoints, videos, and resources from each workshop. The Resources component of the BAYWORK website provides access to all materials that BAYWORK has created and posted relating to knowledge transfer. All resources are freely available and downloadable. In this video, Adam Feffer, (left), San Jose Water, Chair of BAYWORK Website Subcommittee talks about the BAYWORK website. Gwinnett County is located 35 miles northeast of Atlanta, Georgia, with an area of 437 square miles and population of 940,000. Gwinnett was one of the fastest growing counties in the nation during the 1980s and 1990s. There was a 25 year time window that Gwinnett County doubled our population every 5 to 7 years. The current population is approximately 940,000 people. During this period of rapid growth, Gwinnett County’s water and wastewater plants underwent changes to improve efficiencies and enhance operations to meet the increased demand. To effectively serve the citizens of Gwinnett, the Department of Water Resources has 553 employees and growing. It is estimated that 40 percent of the current workforce will be eligible to retire within the next 5 years. This challenge is amplified by the increasing rate of technological advancements and strong competition in the Atlanta area for highly skilled workers. With the mission of providing superior water service at an excellent value, new and innovative ways to develop the workforce are needed. The county's Master Plan called for upgrading and consolidation of the water reclamation facilities (WRFs) in the Yellow River Basin. 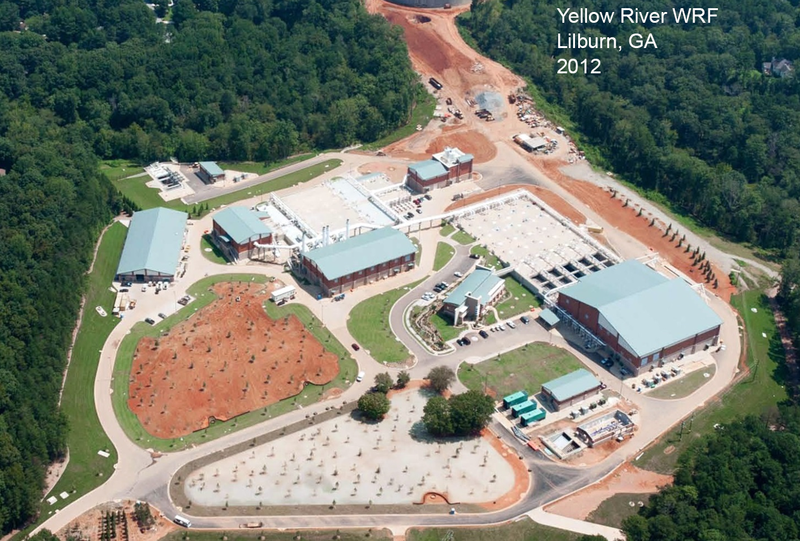 This consolidated the southeastern part of the county into one advanced treatment plant. To accommodate the decommissioning of five smaller WRFs, the Yellow River WRF has been expanded to 22 MGD for the consolidation and its systems replaced by the latest equipment and processes available in the industry. Completed in 2011, the plant is now one of the largest membrane bio-reactor plants in the United States. No longer is it safe to assume a traditionally trained operator is qualified to operate this advanced wastewater treatment plant. They may have the requisite baseline ability to operate at most plants in Georgia, but not necessarily at one of the most complex in the nation. The majority of the operators at the time were trained in the old plant under the traditional training process. The conventional thinking was that licensed operators would figure it out. This dramatic shift in advanced processes, equipment, automation, and computer systems created a skills gap that must be closed to ensure efficient operation of the plant. Closing the skills gap starts with self-analysis to determine the knowledge resources that may currently exist. Leveraging existing resources will save time and accelerate the overall effort. In the case of Yellow River WRF, electronic operations manual and standard operating procedures were already in place for knowledge sources. From these sources, a training management system called a Qualification (or Qual) Card was implemented. This includes quality checks to ensure efficacy of training. Finally, feedback and change management allows for continuous improvements. 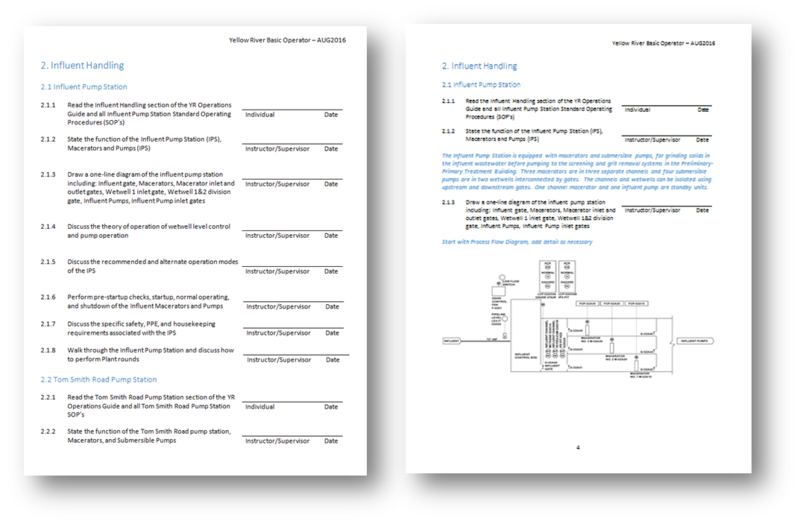 An electronic operation manual (EOM) is an example of a resource that provides the operator with a standardized knowledge retention tool. 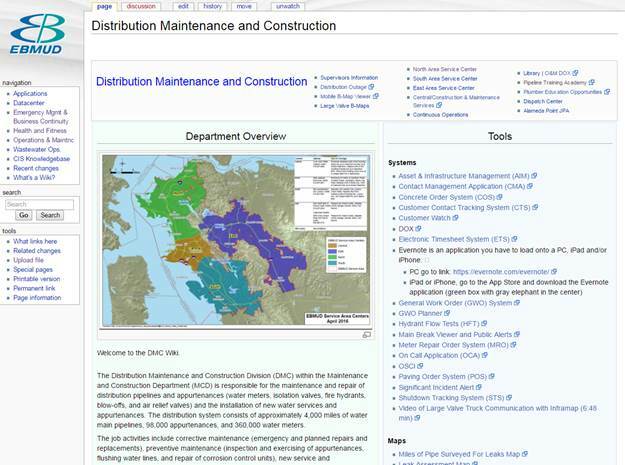 It is a well-organized, searchable, and easily accessible library of operations and maintenance data. It contains information such as supplier operations & maintenance (O&M) manuals, as-built drawings, schematics, renderings, procedures, and protocols to aid in the operation of the plant. To further understand training outcomes, we need to define what a competent operator is and how long it takes to achieve. Simply stated, a competent operator is one who possesses the knowledge and skill to safely and efficiently operate the plant in most conditions. In the notional example below, it is where the operator ability gained from licensing and osmosis reaches the required level of the given plant. Time to train is a metric for how long it takes to become competent. From the example graph, a competent operator is achieved at the 8 year point, at which time they are at 50 percent of their potential ability. This continues to grow over time as the operator gains experience. A factor to consider is how fast are you changing the technology around them? A problem exists if it takes 8 years to become competent and every 6 years the plant is changing major equipment or processes. The Qualification (Qual) Card is a written set of training requirements (see next page). It is sequenced from influent to effluent in the plant with each major section is a process in the plant (i.e., Preliminary Treatment) and each subsection is a system in that process (i.e., Grit Removal). Every subsection, or plant system, starts by having the operator read the EOM and SOPs relating to that system. After the required reading is performed, the operator may complete the subsequent line items in the subsection. The line items are tasked that must be demonstrated by the operator in order to be signed off by the supervisor. Each of the tasks can be referenced back to a section of the EOM or SOP. The Instructor Guide provides the supervisor a tool to ensure a standard level of training is maintained between operators. The supervisor is expected to utilize his or her experience, in addition to the guide, to train the operator. The qualification card directs the on-the-job training throughout the entire plant. It lists what the new operator must know and do in order to become qualified. Between normal plant duties, the operator is expected to study the EOM and SOPs to prepare for the knowledge and skill items. When opportunities arise or at scheduled times, the operator and supervisor will complete line items on the card. When the supervisor is satisfied with the operator’s knowledge or skill, he or she signs to certify that the operator has demonstrated the minimum requirements of that item. This is not intended for liability purposes, as each operator is always responsible for his or her own actions. The Qual Card is structured as a reinforcement cycle to ensure the learning is retained. Each operator must first read the applicable EOM and SOPs and sign when complete. Then they perform discussions, draw flow paths, observe, and performance procedures with their Supervisor present to demonstrate their ability. Finally, they prove their ability to the manager during a quality check. This quality check is not only on the student operator but also the training ability of the supervisor. A finished Qual Card provides documented competency to operate the plant. The result of adding plant specific training program will be a more knowledgeable and skilled operator at a reduced time to train. This closes the skills gap and raises the competency and training standards of the entire team. Furthermore, a culture of learning and improvement will help the team in preparing for future technological changes. 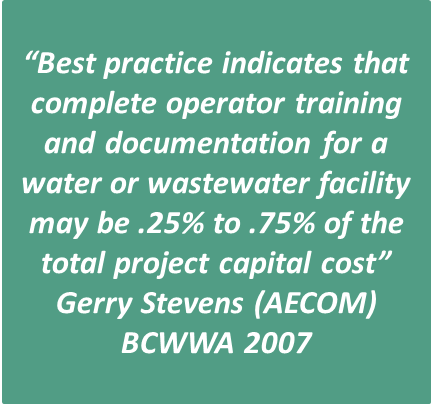 In wastewater plant operations, the traditional training paradigm is focused on state licensing. Georgia licensing requirements are a combination of education, coursework and plant experience that give the operator a baseline ability to operate any plant in the state of Georgia. Operators must pass a test administered by the Association of Boards of Certification (ABC) and apply for licensure. Once licensed, training has largely been through osmosis - a gradual learning by exposure. Typically not structured or standardized, training effectiveness depends on who the operator was paired with and what they experienced on the job. For example, an operator on the night shift might be better trained if most of the problems occur at night and they are faced with a more challenging environment. Contrastingly, a day shift operator may be less proficient because operations tend to run smoother with more help available. In conclusion, as processes and equipment become more complex, technology is outpacing the current ability of operators. It is no longer safe to assume that baseline training is all that is needed in a complex plant. Plant specific training methods may be needed to close resultant skill gaps. Knowledge sources need to be identified and training systems, like Qual Cards, can be utilized to transfer the knowledge to operators. Standard Operating Procedures (SOPs) are another knowledge resource that provides step-by-step operating procedures for plant specific processes and equipment. They detail the operation of equipment, routine preventative maintenance, basic troubleshooting, and safety precautions for every major system. Typical sections are pre-startup, startup, normal operation, abnormal operation, shutdown, and emergency operations.